Fort Ticonderoga had fallen into American hands at the beginning of the War for Independence and was regarded by many as an unassailable guardian of the rebels’ northern frontier. 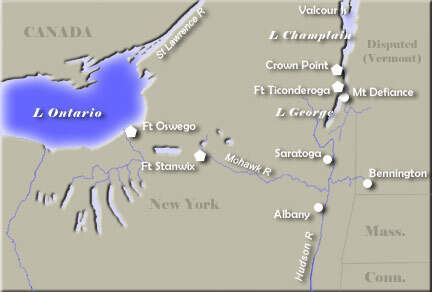 The British had tried an invasion from Canada in 1776, but had been thwarted on Lake Champlain by the heroic efforts of Benedict Arnold and his men. The Americans blithely allowed Ticonderoga to become vulnerable; its manpower and store of arms and supplies were low. The prevailing opinion was that any movement of British troops from Canada would be in the direction of Philadelphia by way of the St. Lawrence River, the Atlantic Ocean and, most likely, Chesapeake Bay. Major General Arthur St. Clair (pronounced Sinclair) had replaced Horatio Gates at the fort in June. His ability to gather intelligence about John Burgoyne’s movements was restricted by the interference of Indians with American scouts. When word did reach Ticonderoga that the British were approaching, St. Clair believed that a show of force was likely, but that no real attempt would be made to take the fort. Burgoyne had left St. John’s on June 17 and arrived in the waters near Ticonderoga at the end of the month. St. Clair slowly began to realize his predicament; he knew his reputation would never survive a surrender and pinned his hope on holding the fort against a direct British assault. Burgoyne, however, refused to cooperate and began preparations for a static siege. In a decisive stroke, the British installed cannon atop Mount Defiance, a hill south of the fort that had not been defended by the Americans. From that position, the British easily dominated Fort Ticonderoga. During the dark hours of July 5, St. Clair and his forces evacuated the fort, heading south at breakneck speed by boat and over land. A handful of troops left behind had been instructed to put up a brief show of force against the British in the morning, then join their comrades in retreat. Those soldiers were found drunk and asleep the next morning when the British occupied Fort Ticonderoga without opposition. Burgoyne left about 1,000 troops at the fort and quickly began to pursue the fleeing Americans. ... was placed in command of Fort Independence, opposite Fort Ticonderoga, by orders of Congress, and against the protest of Washington made a grave military error that almost caused St. Clair the loss of all of his forces. Upon the retreat of St.